Adapted for the stage by David Wood. From the book by Roald Dahl. 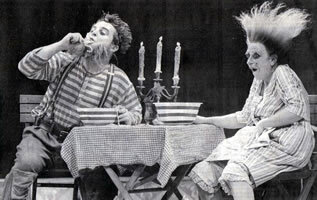 Commissioned by the Belgrade Theatre, Coventry, THE TWITS was first performed there in 1999. 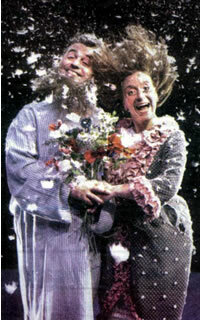 The production was revived for Christmas 1999/2000 at the University of Warwick Arts Centre, and then toured the UK, including Sadler’s Wells Theatre, London. Other productions include the Glasgow Citizens Theatre. Set in a circus ring, which offers great opportunities for a spectacular production, this adaptation brings Dahl’s ideas to life and has the confidence to add something new. Bored with playing silly tricks on one another, the grotesque, satisfyingly revolting couple, Mr & Mrs Twit, turn their attentions to capturing and training a family of monkeys, the Muggle-wumps, for a circus act. The monkey’s cruel incarceration in a cage is avenged when the Birds, led by the Roly-Poly Bird, trick the Twits into believing the world has turned up-side-down. The audience helps in the trick by pretending to be up-side-down (they put their shoes on their outstretched hands). David Wood writes : Roald Dahl’s book is much loved by children. Many of the episodes are so “gross” that to play them for real would probably not be as effective as playing them in a stylised up-front, presentational manner. The fact that the book tells us that Mr & Mrs Twit once trained monkeys in a circus suggested to me the idea of setting the whole play within a circus ring. This means that certain key episodes can be played almost as circus acts. I used a Narrator, who acts as a kind of circus Ring Master. Kathi Leahy’s original production was wonderfully physical, funny and inventive. The original production employed a cast of six actors, plus a team of twelve children, who played optional monkeys and also operated the puppet birds. They undoubtedly enhanced the production, but are probably not essential.